Please read these instructions carefully, as this operation has changed considerably from Wintix 5 to Wintix 6. Run of show prices are used to enter a price code into a show once and have it automatically appear in every performance. 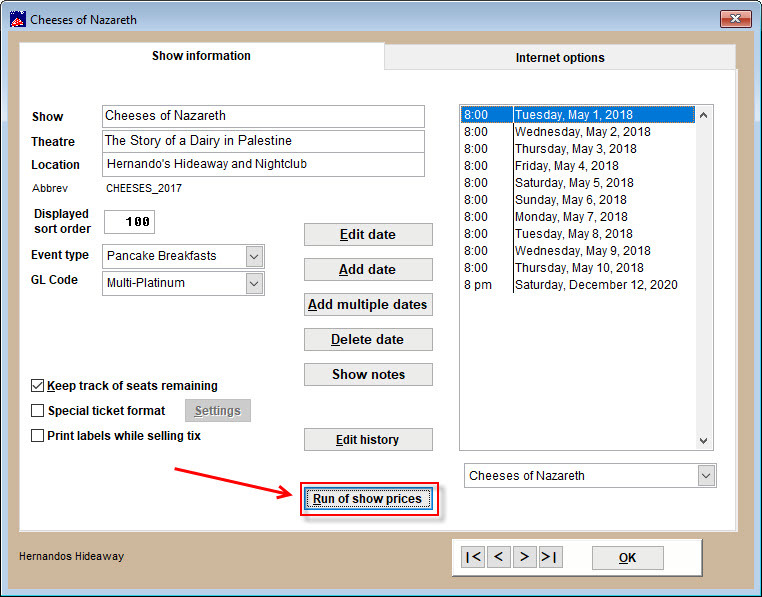 NOTE: Whether you add the run of show prices while adding a new show or by editing a show that’s already in Wintix, we highly recommend using Run of show prices rather than clicking on the tab Prices and categories. 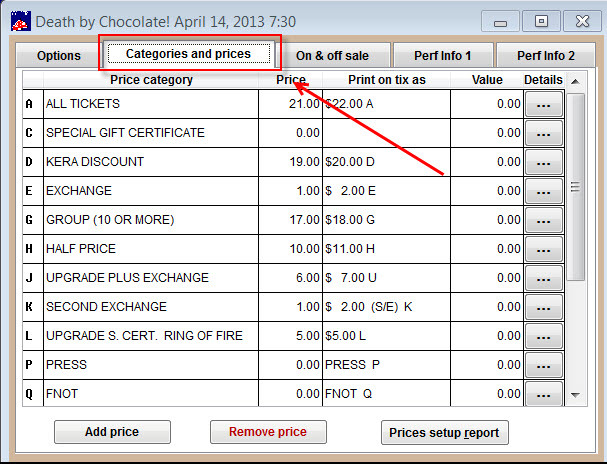 If you enter them into Run of show prices, the prices and categories will populate for EVERY performance. If you enter them into Prices and categories, the prices and categories will only populate for that PARTICULAR performance. 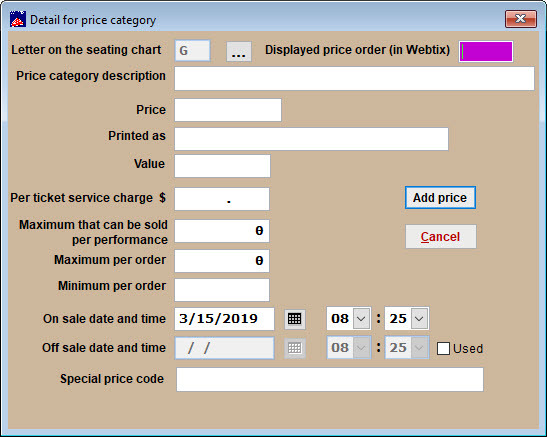 In Wintix 5, you could transfer prices and price categories by checking the Copy price categories box when adding or editing a show. This is no longer the case in Wintix 6. 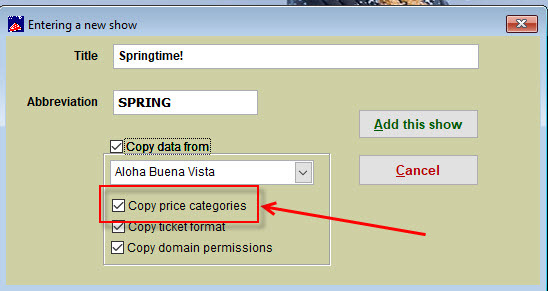 You must now choose Copy run of show prices. Go to Show | Edit a Show. Click on the Run of show prices button. This is the Run of show prices window. To add a price code, click on the Add a price button. (PLEASE NOTE: Below is a screen shot of the Prices and categories window. This is NOT where you want to add your prices for the run of show.) We are including this so you can compare the differences between the two windows. Back to the instructions for adding Run of show prices. The Detail for price category window displays. This is where you will enter the specifications for the price category. Here are descriptions of the fields in this window. This is the letter to be entered into the seating chart while making a reservation in-house or will be automatically entered when purchased online. Wintix 6 allows for unlimited price codes, so you can have multiple price points for each letter. To change the letter that is auto generated, click the ellipsis to the right of the letter. This is the description of the price category. It will be visible to you in-house as well as to your patrons online. This is the price of the price category. This is how the price category will be printed on your ticket if you decides to include that on your ticket format. This is used for season ticket or gift certificate price codes in regular shows. 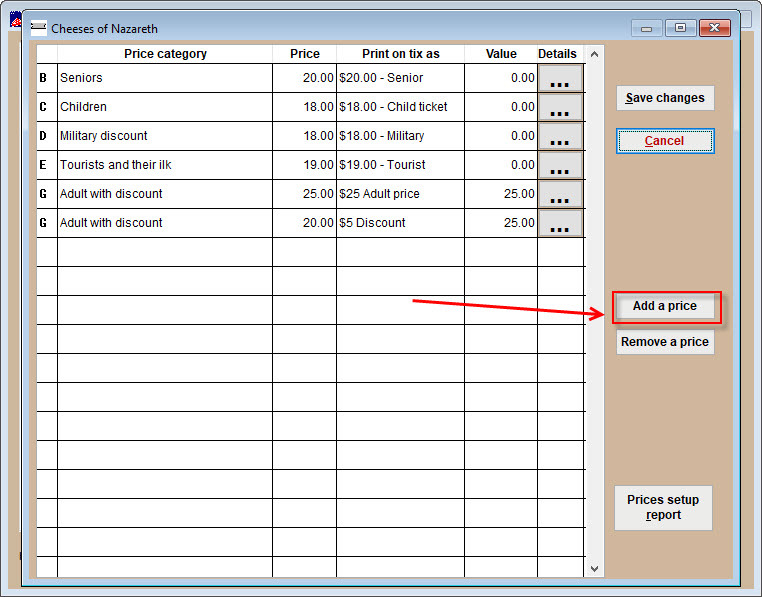 It is used to track the value of a larger priced item after it is allocated into a show. For example if you sold a $100 season ticket that is good for four shows, the value of each show would be $25. This is the amount that will be charged extra per ticket. If you want to limit the number of tickets that can be sold in this price category, you can put the maximum number here. If you do not plan on limiting the number of tickets for a price category to a number less than the total capacity of your event, then leave this at 0 (zero). If you want to limit your patrons to purchasing no more than a certain number of tickets per order, enter the maximum number of tickets here. If left at 0 (zero), there will be no limitation applied. Use this if you want to require your patrons to purchase at least a certain number of tickets in a price category. If your minimum is one, then leave this blank. Enter the date and time you want the price category available. The price category will not be able to be sold after this date and time. This applies to both online and in-house. If text is entered into this field, a patron will need to enter that text to have the price category available to them online. The price code will always be available in-house.